At the same time, ECAs operate in a context of poor transparency and endemic corruption, making their activities difficult to monitor and their influence hard to assess. Explore some of the key issues, concerns and instruments that ECA-Watch is working to address using the links below. Aircraft The aircraft industry relies heavily on support from official export credit. Arms Trade Many ECAs play a major role in the financing and export of weapons to developing countries. BRIC countries The ECAs of emerging economies are taking on an increasingly prominent role, prompting concerns from OECD countries. Climate Change ECA financing can have both a positive and negative impact on the global climate, but in reality ECAs have overwhelmingly financed fossil fuel industry projects which do more harm than good. Common Approaches The OECD Common Approaches make recommendations for how ECAs should address environmental and social aspects of official export credit. 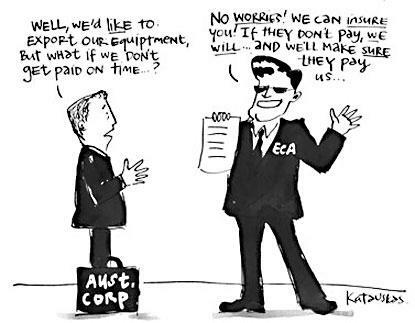 Corruption Corruption and bribery have been major and largely accepted features of ECA-backed projects, causing severe economic, social and political damage to exporting and importing countries alike. Debt ECAs are the largest source of developing country external debt. End Coal Financing ECAs are by far the biggest source of public finance for coal overseas and play a major role in supporting coal globally. According to leaked OECD data, OECD export finance for coal has risen sharply in recent years. European Union The European Union has transposed the OECD Arrangement for Officially Supported Export Credits into EU Regulation 123/2011 which is legally binding for all EU member states. G20 While NGOs and international environmental groups began to coordinate their efforts on OECD ECA "standards", similar pressures were also being pushed at the level of the G20. The general response was to give the impression that national ECAs, international development banks and other institutions were actively concerned about environmental and social standards, with weak transparency, standards and monitoring. Human Rights It has been shown that many ECA-backed projects actually damage the economies of host countries, as well as the safety and human rights of the communities directly affected by the projects. Large Dams Despite the tremendously detrimental impacts of many large dams on ecosystems and people, the OECD supports the industry with special financing terms. Nuclear Governments with a domestic nuclear industry have been helping their companies find new markets and supporting their exports. ECAs became a very important tool for promoting nuclear exports when using aid money became politically problematic. OECD The OECD Arrangement and the World Trade Organization's Agreement on Subsidies and Countervailing Measures (ASCM) establish the global legal framework for export credit provision. Oil, Gas and Mining ECA financing could a positive impact on the global climate, but in reality ECAs have overwhelmingly financed fossil fuel industry expansion projects such as drilling, pipelines, LNG terminals, coal mining and mineral extraction projects which do more harm than good. Pulp and Paper ECA-backed pulp and paper projects have contributed to environmental and social damage including massive deforestation illegal logging, pollution and human rights abuses. Renewables ECAs undermine attempts to introduce renewable energies to developing countries by disproportionately subsidising fossil fuels. Transparency ECAs are the least examined of all international financing institutions, despite providing by far the largest share of public financial investment from global North to South. World Trade Organization Complex WTO rules on state subsidies affect countries’ export credit activities. These rules are intimately linked with the OECD Arrangement for export credits.